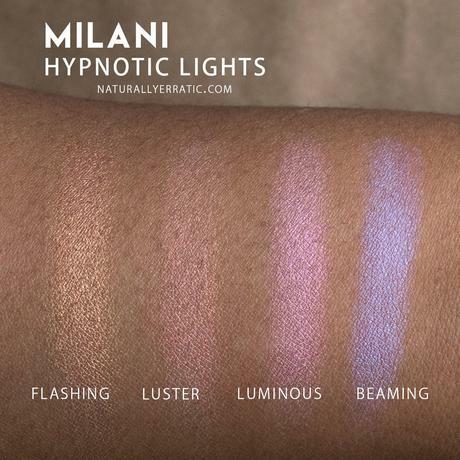 Recently Milani Cosmetics sent me their entire Hypnotic lights collection in PR, today I'm reviewing the Hypnotic lights powder highlighters. 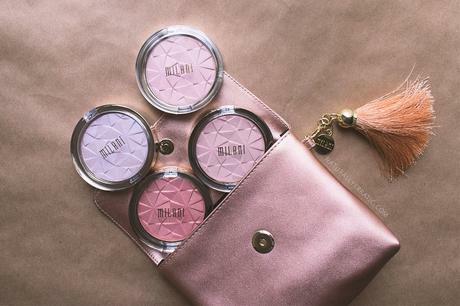 I a huge fan of Milani Cosmetics and so happy that they are a cruelty-free makeup brand. Currently the Milani Hypnotic Lights Powder Highlighters comes in 4 different luminous shades. The Hypnotic Lights powder highlighters are really beautiful highlighters, not at all powdery when applied. I like that they are not super metallic, when on the skin they have almost a diffused looking glow. My favorite color of the Hypnotic Lights powder highlighter is Flashing, it is a beautiful light-bronze gold without being too yellow a perfect color for my skin tone and current highlighting preferences. I have been gradually moving more towards highlighters that aren't so much lighter than my skin color so there isn't this bright strip on my skin but rather a more understated glow and shine. I just think it looks more natural and not too obnoxious and Flashing is that perfect kind of shade for me. All the colors are gorgeous and I love that they do not have a noticeable base pigment, they really blend seamlessly into the skin without looking ashy or leaving a weird shadow when you're not in direct light and at the right angle. Overall these are a solid pick for highlighters to me. Would recommend. Thank you so much for stopping by Naturally Erratic, I hope you enjoyed the content here. This post contains affiliate links, thank you for supporting Naturally Erratic by shopping through these links. Have a beautiful day.